"Cajun cooking is a combination of French and Southern cuisine. It is robust, country style cookery - and so is this dish! Laissez le bon temp roulez and bon appetit!" Place the chicken and the Cajun seasoning in a plastic bag. Shake to coat. In a large skillet over medium heat, saute the chicken in butter or margarine until almost tender (5 to 7 minutes). Add the red bell pepper, green bell pepper, mushrooms and green onion. Saute and stir for 2 to 3 minutes. Reduce heat. Add the cream, basil, lemon pepper, salt, garlic powder and ground black pepper. Heat through. Add the cooked linguine, toss and heat through. Sprinkle with grated Parmesan cheese and serve. 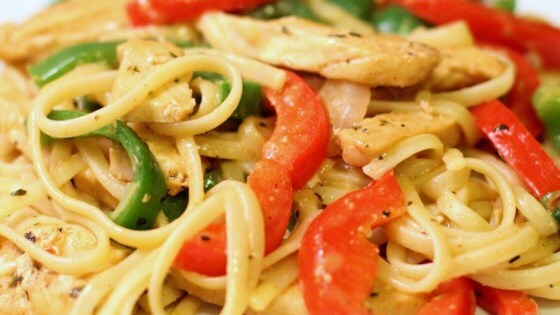 Dinner is ready in under an hour with this Cajun-spiced chicken pasta.